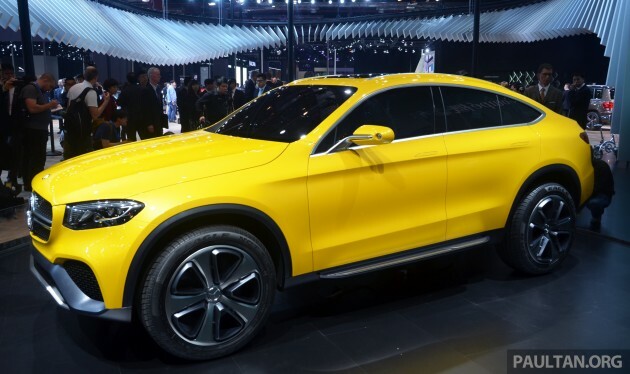 Daimler R&D chief Prof Dr Thomas Weber has revealed to The Detroit Bureau that the Mercedes-Benz GLC Coupe concept we saw at Auto Shanghai will be going into production. 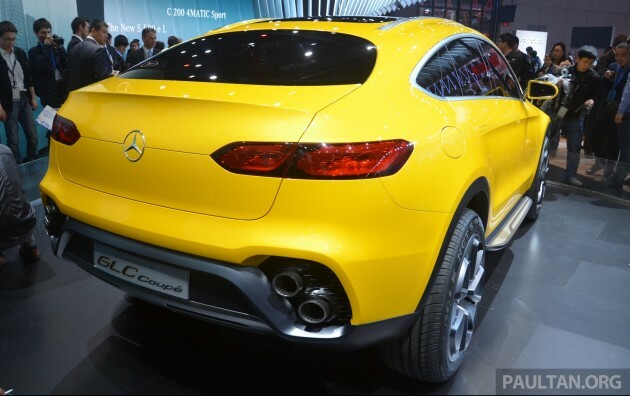 He also said the road-going GLC Coupe will be introduced after the (non-coupe) GLC and GLS are unveiled. According to Autocar UK, Stuttgart’s BMW X4 fighter could be heading towards a 2016 or 2017 debut. Our Euro spies have only spotted the non-coupe GLC so far. They call the yellow fellow you see here a “near-production-standard study” – in other words, besides the tiny wing mirrors, hidden door handles and vertically-stacked quad tailpipes (aww man! ), this is pretty much it. The concept is 4,727 mm long, 2,000 mm wide and 1,593 mm tall, with a 2,827 mm wheelbase. Which means it’s longer, lower and a lot wider than the X4, while packing a 17 mm longer wheelbase. The show car hid a 367 PS/520 Nm 3.0 litre twin-turbo V6 (‘450’ AMG Sport motor) under its bonnet, while packing a nine-speed 9G-Tronic auto and 4Matic all-wheel drive. There should be a full-fledged AMG variant too, with a 476 PS/650 Nm 4.0 litre twin-turbo V8, if reports are to be believed. Because the new GLC will reportedly come in right-hand drive (the GLK was a lefty only), it’s safe to assume the same for the GLC Coupe. Likewise the engines – speculated is a base GLC 250 with a new 1.8 litre four-cylinder turbo engine, a GLC 250 BlueTEC with the familiar 2.1 litre four-cylinder turbodiesel and a V6-powered GLC 350. Stacked up quad exhaust, Lexus F inspired?? Shape copy BMW, exhaust pipe copy Lexus. Mercedes you are doom. What’s so proud about China get so much good car with lower price. Malaysia have Proton as hood as BMW and volvo !!! Good one, ‘no door handles’ and over 2 metres. it’s mandatory for GLC’s CEO..